Samantha and Nathan knew the first time they talked to me that they wanted snow involved in their engagement photos. They knew it would fly too! This winter started off with a bang as we watched the inches pile up in areas that had not seen snow in years. And then we had a heat wave in February. As the date for the session got closer, the snow was moving farther and farther up the hill. 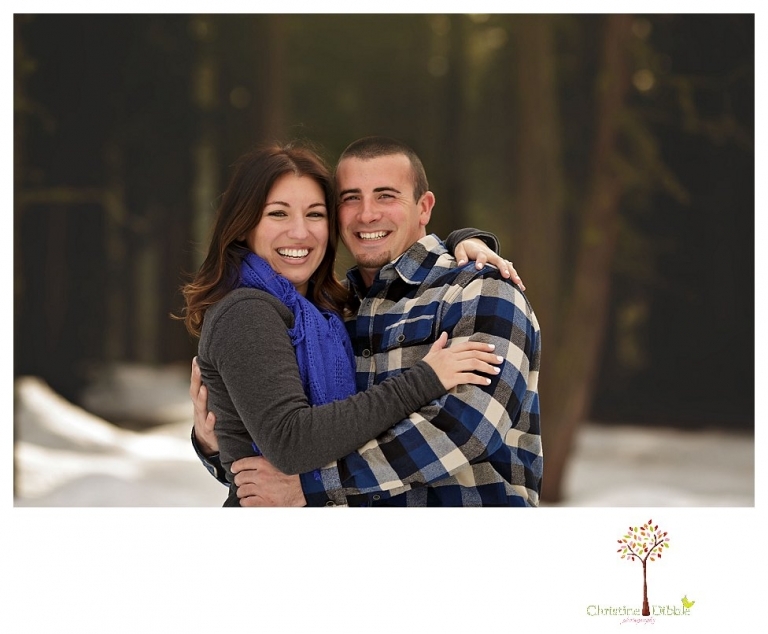 On Valentine’s Day, the day of the session, we had to go all the way to the lake to get their snowy Pinecrest engagement! But it was worth it for the amount of snow we found and the gorgeous light that played peek-a-boo through the clouds as we wandered. Both Samantha and Nathan stepped through the deep snow into water, but thankfully, that was near the end and their boots kept them from being totally soaked. They laughed the entire time, and the snow did fly. Their autumn wedding at the Black Bear Inn should be just as fun! Corey - These two look like such a fun couple – and so in love! I love the snow and the trees! So perfect and definitely worth the hike! I can’t wait to see their wedding photos! jeanine - What great images for their Sonora engagement photography session! Love the moments and emotions you captured! Beautiful work! Maria - Beautiful location for a Sonora engagement session! Who would not want snow in their session?! It looks like they had so much fun! 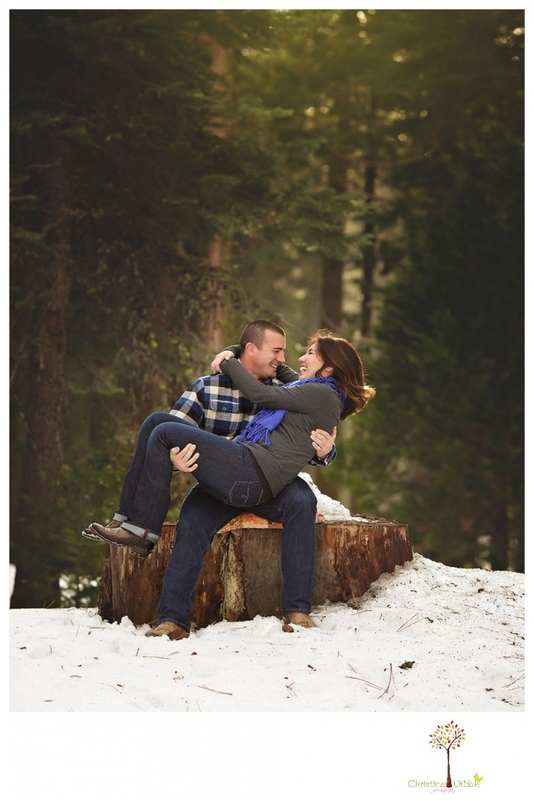 Jenny Storment - This snowy pinecrest engagement session looked so fun! The couples personality really came out in their engagement photos. I can’t wait to see their wedding! Brenden - These Sonora engament photos are beautiful!! I love that they wanted snow. It’s so romantic, and the snowball fight is so fun! Beth - Um, perfect engagement session!! Stunning Pinecrest backdrop, beautiful couple, and so my fun and happiness!! Your work is truly stunning, it just keeps getting better and better. Thank you for sharing!!! Rebecca massimino - I’m smiling looking at these! It was so worth the trek up the hill to get these engagement photos! The are such a cute and fun couple… Wonderful Sonora engagement photography. You always seem to find the best locations for your Sonora engagement sessions! I love the glowy warm light, cool snow and fresh pine needles on the ground. Well done! Jennifer Rittenberry - Samantha and Nathan look like a really fun couple, and I’m sure that is a deciding factor as to why they chose you to be their engagement photographer. You have to be able to connect with your clients in order to draw out so much character and personality, and you did so with flying colors. This tells me that they trusted you, your artistic vision and your creative eye for how the session would be setup and executed. I love so many of the images in their gallery from the snow covered Pinecrest that it’s hard to pick just one, but if I had to narrow it down to a few then it’d be the one of them leaning on the tree together and the snowball fight series. These really showcased their big personalities and just bottled it up for them to relive any time they want to! I can’t wait to see the wedding photos of this Sonora couple! Samantha - These engagement by Sonora Photography are so perfect! The love these people have for one another is so evident in these photos. They just look so happy and energized by each other’s company. I love the snowball fight photos! I really love the way the trees look in the background. The way the trees are softly blurred in the background makes it almost look like a painting. So beautiful. Jennifer - Christine this has seriously got to be the best engagement photo session I had ever seen. First I was wowed by the light, the woods, that amazing couple, and that huge log. As I got to the end and seen the fun these two had together throwing snow balls and piggy back rides it made me for a split moment jealous and want to be in their shoes doing that with my husband. I can only imagine how amazing their wedding will be and look forward to seeing photo’s from their session!